TNPSC Notification is out. TNPSC is recruiting for 41 Assistant Engineer and Principal Govt Job Posts. You can check TNPSC - Tamil Nadu Public Service Commission last date, download TNPSC notification, visit TNPSC official website and check other TNPSC Vacancy details.Complete Vacancy and recruitment Details about 41 Assistant Engineer and Principal Govt Job vacancies in TNPSC are provided below by JobSarkari.Com only for you. Last Date for Apply Online 24/12/2018. Last Date for Payment of Fee through Bank (SBI or Indian Bank) 27/12/2018. General / OBC Rs.350/-. (Rs.300 for Assistant Engineer). Total No of Post 41. Training Candidate Must Have Passed Degree in Engineering / Technology and 03 Years Practical Experience in a Workshop or Factory. Assistant Engineer (Industries) Candidate Must Have Passed Bachelor Degree in Engineering / Technology (except Civil Engineering and Architectural Engineering ) and Practical Experience in General Purpose Engineering Workshop or in an Engineering Industry or Practical Experience in a Supervisory or Operative Capacity. Maximum Age for UR Category 30 Years. 6.Online Application Can be Submitted on or Before 24th December 2018. Q. What is the Last Date For TNPSC Assistant Engineer and Principal Govt Job Vacancy ? A. 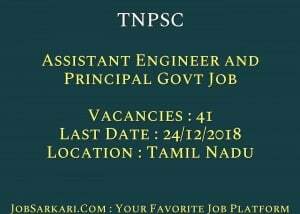 Last Date for TNPSC Assistant Engineer and Principal Govt Job Posts is 24/12/2018. Q. What is the Form Type of TNPSC Assistant Engineer and Principal Govt Job Recruitment ? A. The Form Type for TNPSC Assistant Engineer and Principal Govt Job Posts is Online. Q. 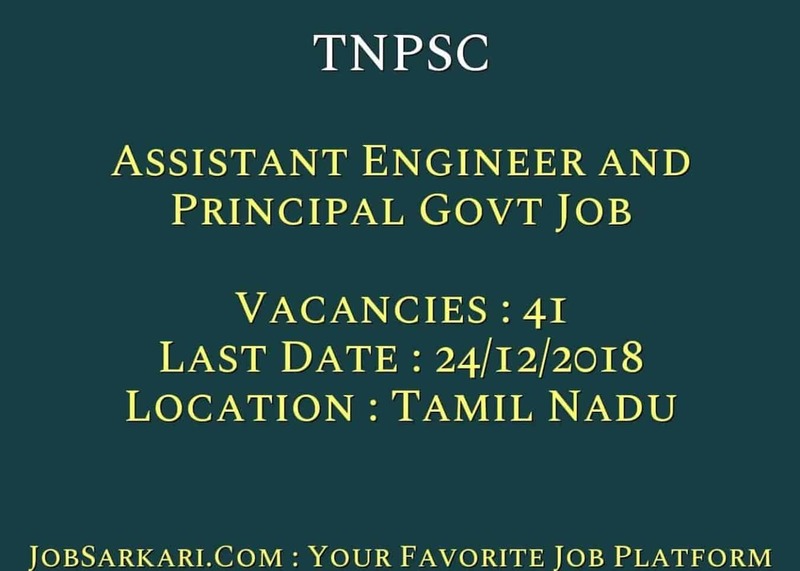 How many vacancies are available in Tamil Nadu Public Service Commission Assistant Engineer and Principal Govt Job Posts ? A. There are about 40 Vacancies in Tamil Nadu Public Service Commission Assistant Engineer and Principal Govt Job Posts.